President Moon and Philippe of Belgium had a summit at the Blue House on March 26 and discussed on friendship and substantial cooperation between the two countries and the situation on the Korean Peninsula. 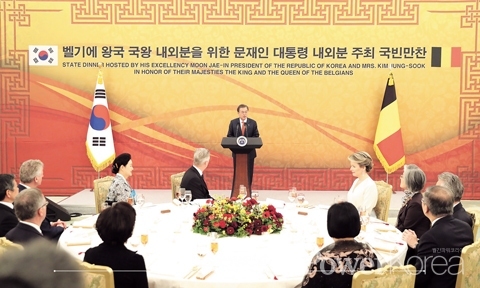 46 delegates of Belgium, Korean War veterans of Belgium and Korean government, economic and cultural leaders attended the state banquet. “I was in the most beautiful city in Europe last year. I felt everybody seemed free there and their culture was proudly present. It was overwhelming to witness that the world became one at the 12th ASEM Summit held in Brussels and that the power of unity the Belgians had” said Moon. “I visited the Seoul National Cemetery to pay a respect to the Belgians who fought and died during the Korean War. I was deeply touched by President Moon’s showing great respect and gratitude. I will keep providing my support to establish peace on the Korean Peninsula and to strengthen cooperation between the two countries” said Philippe of Belgium.